Sacramento police on Thursday released body-camera images from a controversial encounter last month in which an officer grabbed the arm of a pregnant woman who moments later fell to the ground. The department released a statement saying officials decided to post the dramatic and, at times, profane video, which is broken into four clips, on YouTube because they’re dedicated to transparency. On July 9, a police license-plate reader detected a stolen vehicle, according to the statement, and officers soon found the car and detained a female driver. But police then began looking for a male suspect, who they say had an outstanding warrant and was last seen at an apartment complex in northern Sacramento. Officers eventually went to the complex and spotted a man who police say closely matched the suspect’s description seated outside the apartments. Police said the man ran inside and locked the door. In the first clip, the officer wearing the body camera charges toward the apartment screaming, “Hands! Let me see your hands, put your hands up!” He then screams, again, using an expletive as he tells someone to put their hands up. 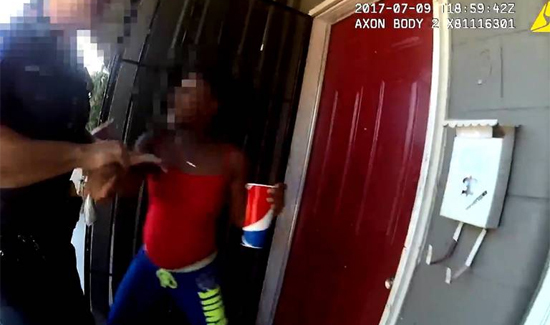 The video is too dark to tell who the officer is speaking to, but moments later the camera captures an image of the pregnant woman standing in front of the doorway. The Sacramento Bee newspaper identified the woman as Zityrua Abraham and said she told reporters after the incident that police threw her on the ground. A second later, an officer pulls her by her right arm, away from the porch. The officer wearing the body camera then turns toward the doorway, so the woman isn’t seen falling to the ground. But a few seconds later, her reflection in a window shows her getting up from the grass. In the second clip, the woman tells an officer that her stomach is “tensing up” and he asks her if she needs medical attention. “Yes,” she responds. “I do.” The officer then says he’ll call her an ambulance. In the third clip, the same officer explains to the woman that they’d received a tip that someone who looked like the man they’d seen in front of her apartment had stolen a car. The suspect, the officer said, had a felony warrant and “a really violent past.” The Bee identified the man as the boyfriend of the pregnant woman’s mother. In the last clip, an officer lets the man out a patrol car and removes handcuffs from his wrists. Another officer then explains to the man that they’d mistakenly taken him into custody because he matched a suspect’s description. Two days later, police said, the woman filed a complaint with the department’s internal affairs division. The investigation is ongoing, but officials said in a statement that none of the involved officers have been put on leave. The delay in releasing the video, police said, was meant to protect the integrity of the investigation, which they said had progressed far enough by Thursday that they felt confident its release would not compromise the investigation. Another farce where the woman is hindering the police from chasing a subject that went into her house. She ws asked to get out of the way and refused to do so. the officer moved her to the side professionally, the police went into the house and found the boyfriend. He looks like subject, they detain him. All the other crap is playing the race card once again. good job officers, aren’t you glad you have the body cams now? They will save your butts many a time as long as you are doing right. Be safe out there. Body cams are a blessing to officers that do the right thing. I believe they will clear these officers of wrong doing and reveal how phony the woman is. Pretty fair actress though. Golden globe anyone?